There are a lot of jobs in the warehouse that people just don’t want to do. Usually these are the more difficult and/or time consuming jobs. 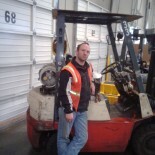 More often then not, there will be time spent on your feet rather than on a forklift. Sadly, these jobs are usually more important than some of the jobs that don’t usually require somebody to get off of their forklift. Typical reaction to somebody being asked to do one of these jobs is usually something to the effect of “I don’t see why I should do it” or “I am already busy and see no reason to do that”. Simple truth, just about any response regarding one of these types of jobs boils down to “What’s in it for me?” Sadly, as greedy and vain as this may seem, it is not at all surprising. Salvation can be the same way, however, it would be from God’s perspective. Why should God care to save any of us from our sins? What’s in it for him? If we can be honest with ourselves, there is no good reason for God to save any of us. We are all sinners and are all worth of eternal punishment in Hell. Nope. Not a single one of us deserves to spend eternity in paradise. Children are very interesting. Unless there is something in it for them, they don’t generally seem too interested in doing either their chairs or homework. Oddly, even though they don’t deserve it and haven’t earned it, parents still feed and cloth their children and even provide them some form shelter in which to sleep. Nope. They didn’t earn it, but they are still getting it. Tonight is the night before Christmas. In the morning we commemorate the birth of Christ Jesus, God come in the flesh. In coming into our world as Christ Jesus, God gave us the ultimate gift, which we did not deserve. However, this gift came at a price. In the person of Christ Jesus, the Lord God would allow himself to be put to death on a cross. What was in it for him? Not very much. He would suffer an agonizing death and buried in a cold grave. Three days later he would rise from the grave. What was in it for him? Not very much. Just that he established that he was God almighty and had authority over all of creation and it was in his providence to judge the sin of humanity. In doing so, he also established something else. God established that only by one name can we be saved. He also established that all of creation was subject to his law, including you who are reading this. What was in it for him? Just the establishment of his his authority. What was in it for us? Plenty. In coming into this world and taking our flesh upon himself, God gave us deliverance from sin, death, and eternal punishment, but only unto those that will believe. Whenever asked to do am odd job that is not a part of your normative routine, don’t reject it out of hand, asking “What’s in it for me?”. Instead, consider how God sacrificed almost everything, with almost nothing in for himself, and chose to be born in this world to die for our benefit. Such being the case, just as God did what had to be done to provide us with salvation, we should just go ahead to do what we have to do in our jobs, and forget about any prospect of reward. Through what Jesus did from being born and placed in a manger to his death on the cross, he paid for our ultimate need. Its time to stop asking “What’s in it for me?” and to start doing what must be done. Merry Christmas to all. Give thanks to God for another day of life, both now and in eternity. May it be that Jesus remains forever the reason for the season. He didn’t ask “What’s in it for me?” He just did it and that should be our mindset too. May it be so. This entry was posted on 24/12/2013 by Christopher Rose in Uncategorized and tagged Christmas, Hell, Jesus, Paradise, Salvation, Sin, The Ultimate Gift.